A clogged drain is one of the most common plumbing issues that can happen in a home. 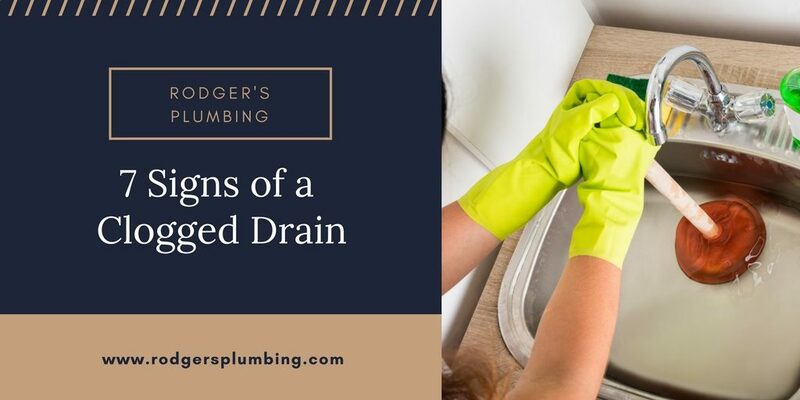 Whether a clogged drain is in your bathroom or kitchen it can be a headache and cause a big mess. Some of the plumbing issues that are caused by clogged drains are slow draining showers or bathtubs, and clothes washers and dishwashers unable to finish their cycle. Nobody likes that feeling of taking that hot shower with water rising up your feet in the tub. A clogged drain can be an easy fix and can also lead to bigger issues if not addressed as quickly as possible. Kitchen sinks: The build-up of grease, soap, food particles, and ground up food from disposal. Bathroom sink/tub: The build-up of hair, soap, and toothpaste. Bathroom toilet: The build-up of toilet paper, wipes, paper towel, and feminine hygiene products. Having plumbing services performed can help avoid any serious issues from occurring. In some instances a drain clog can be severe enough that it can damage your plumbing system. Call Rodgers Plumbing today and have us evaluate your plumbing system.